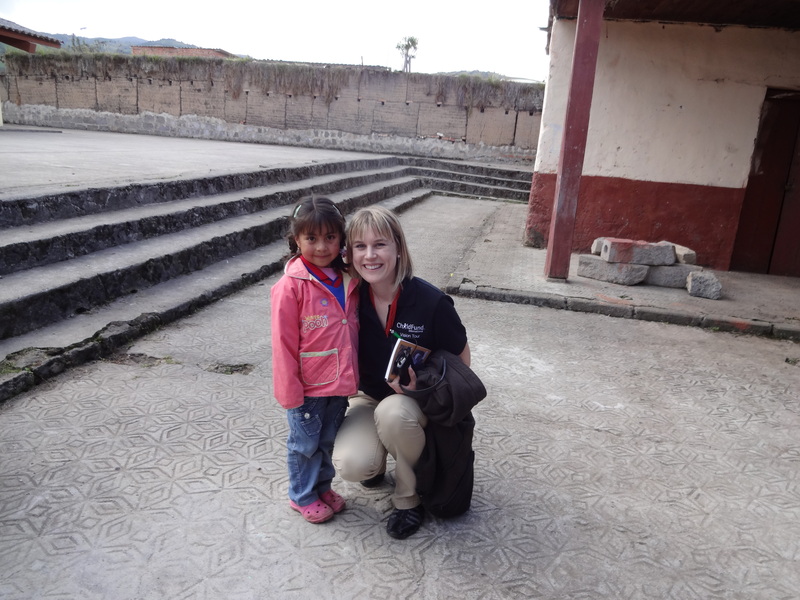 As I reflect on my recent trip to Ecuador with ChildFund, these words cycle in my mind. Spoken through tears with conviction and emotion, each mother we met pleaded with us to share their stories with the rest of the world. So, here goes. The sun was barely rising on a Tuesday morning when our group set out in a bus from Ecuador’s capital, Quito, to visit communities in Carchi. 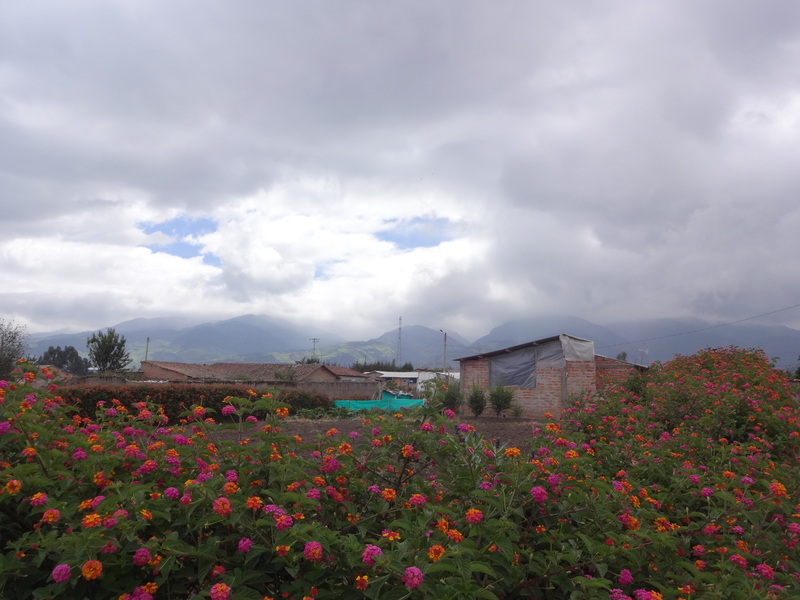 This region of Ecuador borders Columbia, and ChildFund has been helping communities here since 1984. We had been preparing for this trip for months, knowing that we would meet the mothers and children whose lives are being transformed through ChildFund’s Early Childhood Development program (ECD), which strives to holistically help children ages 0-5 to ensure they reach their full potential. ChildFund works with vulnerable families in communities that are often far from cities or government assistance. Surrounding us throughout our drive were crisp blue skies and undulating bright green mountains, speckled with colorful houses. When we think of poverty it’s easy to envision urban slums fraught with trash heaps and filthy alleyways. The view here was much different. It’s easy to think, “It’s beautiful! I could live here!” But I quickly learned that the beauty of the land masks the underlying poverty, discrimination, lack of opportunities and exclusion that the people who have lived here for centuries continue to face. This fact became apparent as soon as we met Monica. After four hours of jostling along bumpy dirt roads, steadily climbing up steep mountain sides, we came to a sudden halt. We were instructed by Mauricio, our guide and a ChildFund Ecuador staff member, that we would be visiting a home in the community. 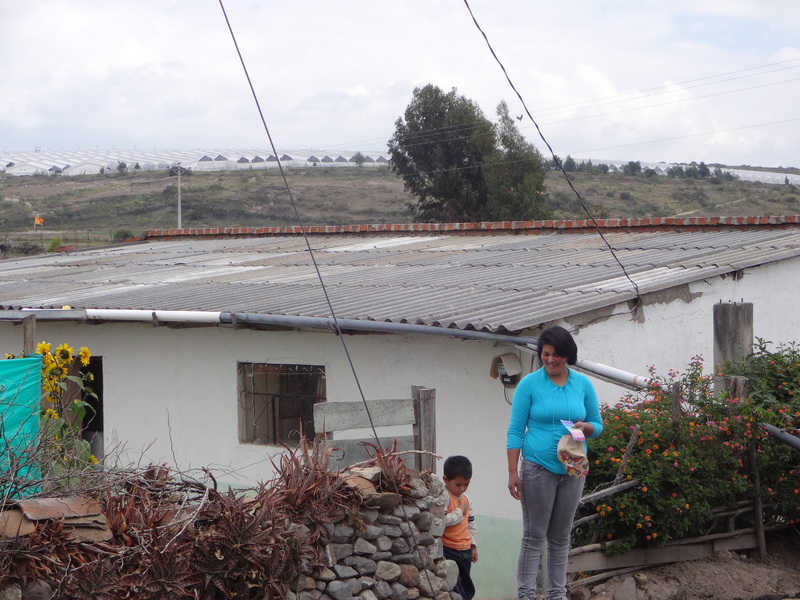 Monica and her son, Daniel, greet us in front of their home in Carchi, Ecuador. We walked down a dirt path and were greeted by Monica and her 4-year-old son, Daniel. Fields of corn and wild flowers skirted her property. A scruffy stray dog rubbed against my leg, eager for a pet. Monica led us to her home, which had a corrugated tin roof, cinderblock walls and three rooms. We followed her into the living room and took seats in a semi-circle, eager to hear her story. Monica is 41 and has four children, ages 18, 11, 6 and 4. She told us how her husband abandoned her and left her to care for the children on her own. Every day she works in the fields to make a living for her family and her father, whom she takes care of as well. As Monica shared these details, her voice broke and she began to cry. She said there were times in the past when she would come home from a long day, stressed and tired, and she would take this out on her children by beating them. The youngest, Daniel, whom she holds affectionately in her lap as she talks, became fearful and withdrawn at that time. Daniel and his mother are now very close. Hugging Daniel even tighter, Monica said she wants to use her experience to teach and support other mothers in the community so their children will be able to grow up healthy and empowered. In these excluded communities where ChildFund works, 18 percent of women are married by the age of 15. Forty-percent of women are married by 18 years old. She shared how she wants to pursue her dream of finishing high school and becoming a teacher. And she smiled as she shared that Daniel is now playful, cheerful and likes to go to school. “All is worthwhile for the happiness and welfare of my children,” she said. Kate with a child in the ECD program. 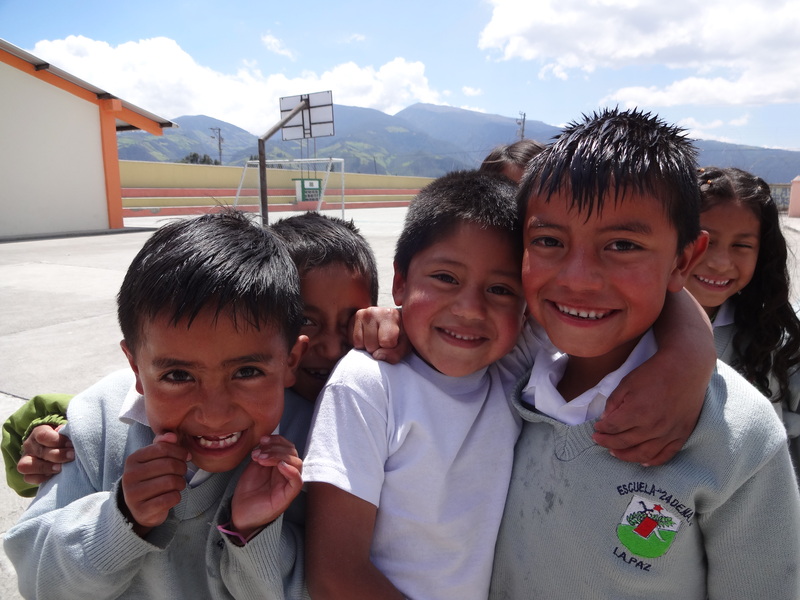 Children giggle during recess at a local ECD center. the community as a whole as their children grow up healthy, educated, and full of ideas to improve their lives. 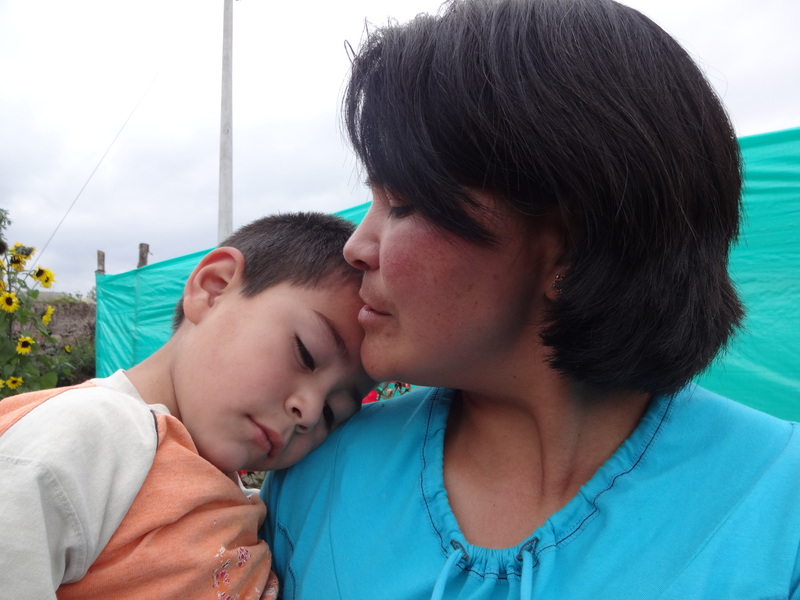 Monica and the 1,200 other Mamitas in Carchi are living proof of this transformation. I now have a picture of Monica on my desk to remind me of her story, and why we do what we do here at ChildFund. I will never forget the Mamitas I met in Ecuador who are committed to a better future for their children. This entry was posted in Early Childhood Development, Programs and tagged Americas, children, early childhood development, Ecuador, poverty. Bookmark the permalink.